Mike Corrigan in his retail shop. 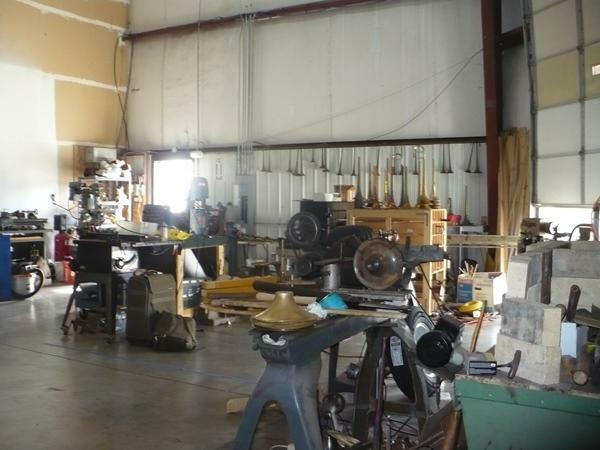 SLIDESHOW: Inside Mike Corrigan's instrument repair workshop. Click for more photos. Tools of the instrument-making trade. 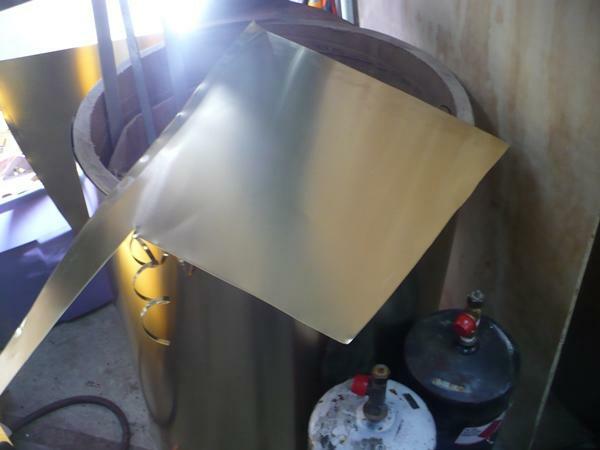 Most of the custom-made instruments start out as a sheet of brass. Corrigan shows how he zips up the horn. 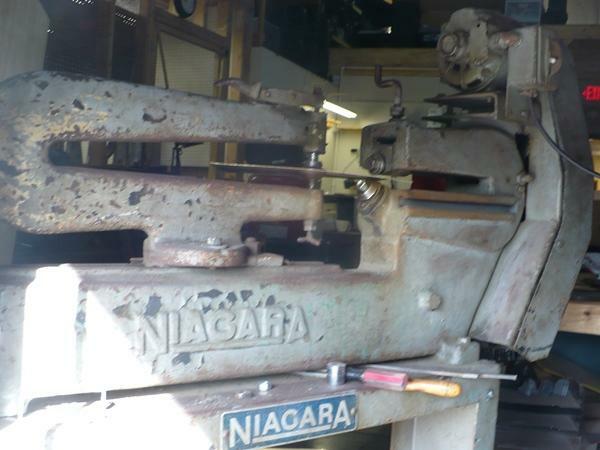 Mike Corrigan collects antique equipment from famous old instrument-makers. 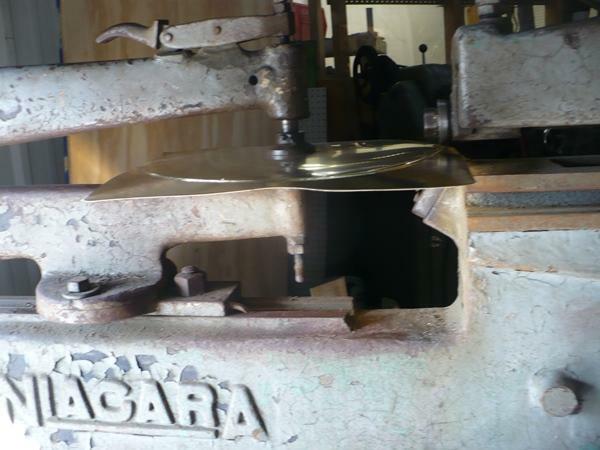 This is a brass cutter. The brass cutter works like a giant can opener. Mike Corrigan hand-spins a bell, a process that's rarely used anymore. 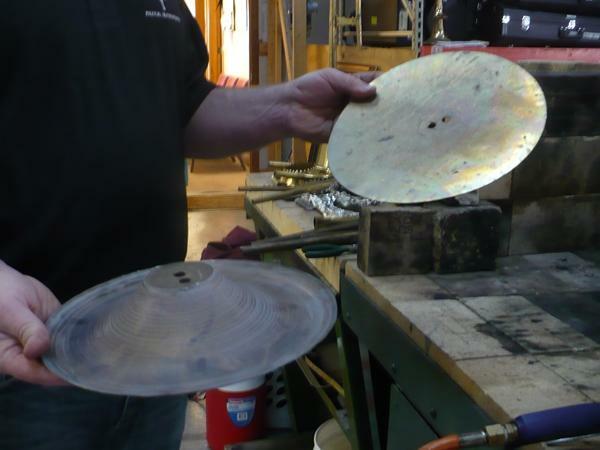 Before and after: a bell is spun from a brass circle. 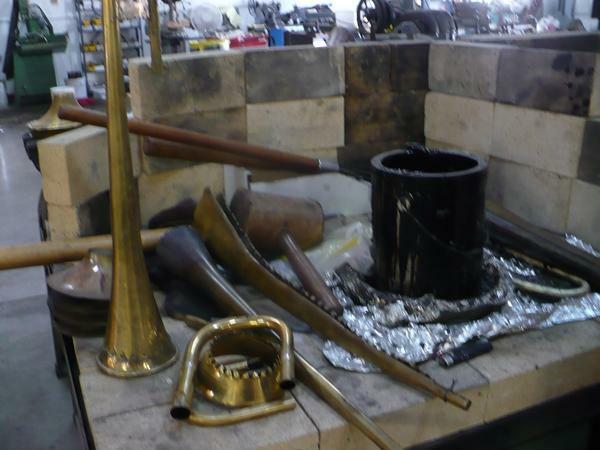 Annealing the horn softens up the metal. 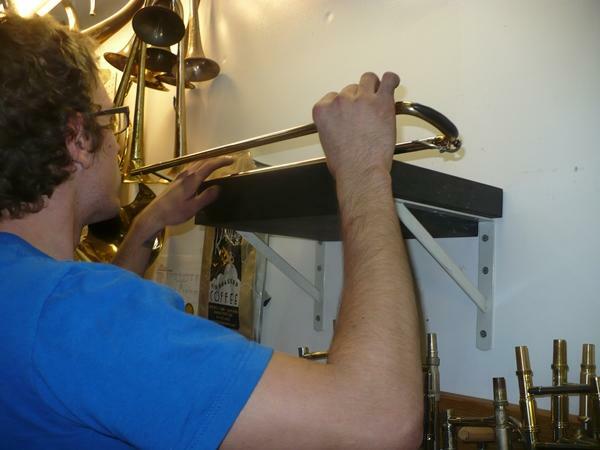 Darryl Wilson fixes a trombone slide. Darryl Wilson uses a granite block and a light source to check if the trombone slide is perfectly parallel. 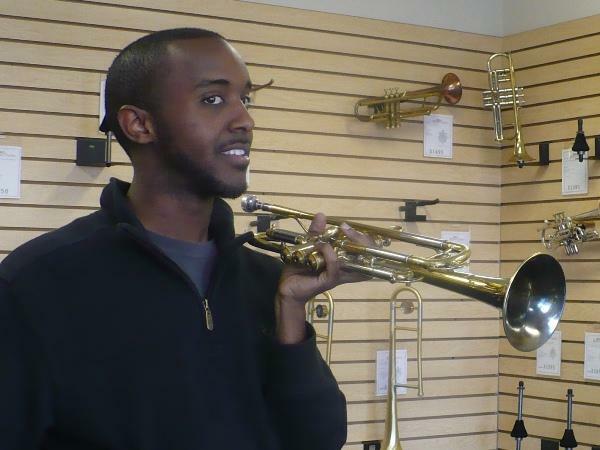 Musician Hermon Mehari tests out a BAC custom-made trumpet. 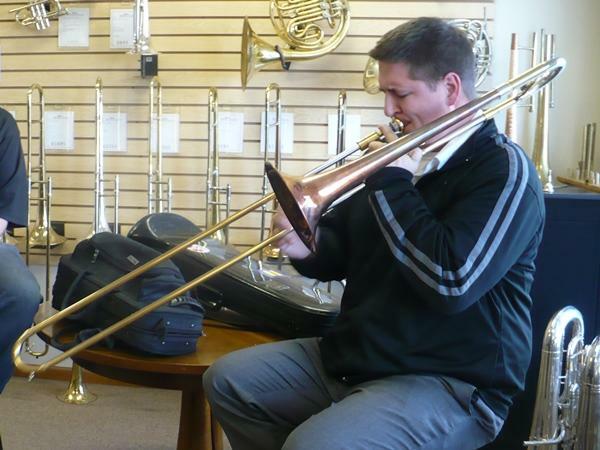 Musician Ryan Heinlein plays a tune on a BAC trombone. For KC Currents’ Odd Jobs segment, Sylvia Maria Gross paid a visit to a master craftsman in Olathe, who is custom-making instruments for some of the top jazz musicians in the country. Shorter feature story aired during Morning Edition. Longer feature story aired during KC Currents. 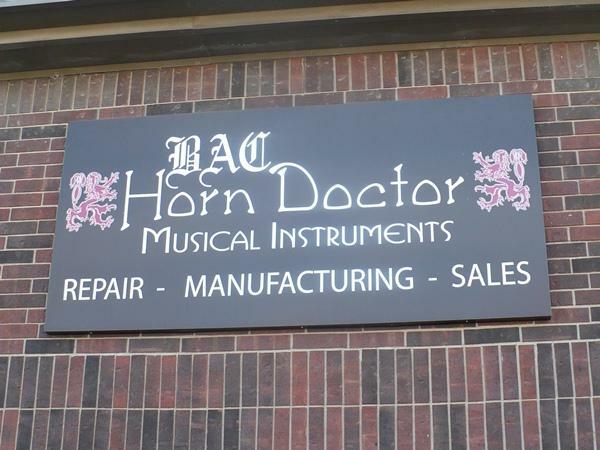 Mike Corrigan calls himself the Horn Doctor. He knows the physics, chemistry and geometry behind making music, from the unique properties of brass, copper and silver to the angle of a bend on a horn bell. 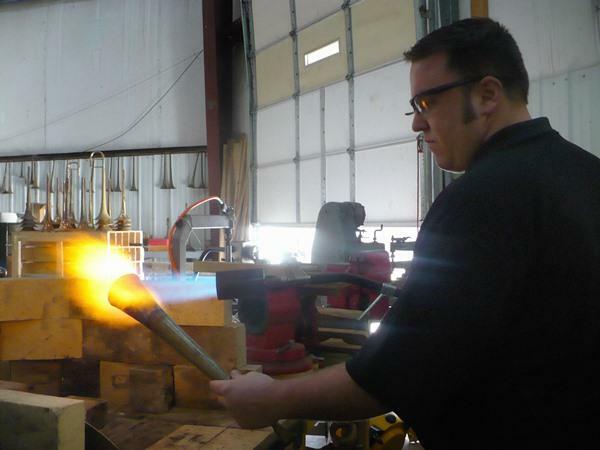 Most instruments nowadays are stamped out in modern factories, but Corrigan loves the magic of metal-smithing techniques used to craft 16th century horns. "The way they were made didn’t change very much," Corrigan says. "I could picture myself going back in time. And if I was to go back in time, I could do this. The essential part of any horn, past or present, is that flared end: the bell. "The way that a bell is made is definitely going to have the biggest impact on how the horn plays and sounds," Corrigan says. 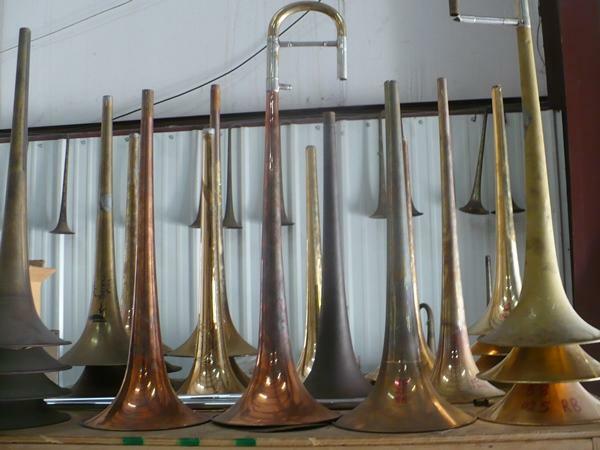 A typical trumpet or trombone starts out as a sheet cut from a roll of yellow brass. 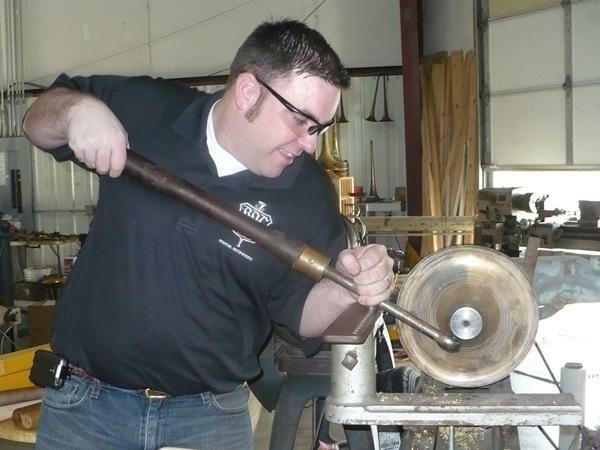 Corrigan demonstrates how he cuts it on an antique brass cutter that works like a giant can opener. A trumpet starts with a shape that looks like a Y. Corrigan solders it into a cone and hammers it on an anvil. The end of the bell is shaped on a spinning lathe. Corrigan leans into it with a long rod that has a knob at the end. He says very few instrument-makers hand-spin bells anymore. It’s time-consuming, and physically challenging. "You got to put a lot of weight onto it to get the metal to move," Corrigan says. "This is pretty thick material I’m working with." Corrigan actually started this company based on his reputation for repairing trombone slides, the long, parallel tubes that slip in and out. He says he has a special process for polishing the slides so that they feel "like butter." "So when a musician's playing a lot of quick notes, they don't have to be fighting their horn and have the slide interfering with what they are thinking in their head," Corrigan says. "We want them to be able to portray their voice and their thoughts they have in their music without having any difficulty from their equipment. Elliot Mason is one of Corrigan's most prominent clients. He's the trombone player for Wynton Marsalis’ Lincoln Center Jazz Orchestra. 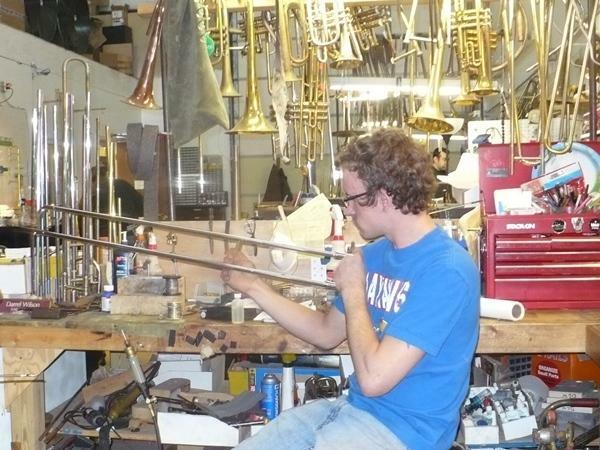 He currently plays on one of Corrigan's instruments, but they're working together to design a prototype for the "perfect trombone," at least perfect for Mason. Mason's come to Olathe some ten times to work with Corrigan and test the latest experiment. "He thinks so fast that he needs an instrument that is really flexible and has a lot of agility so he can get all over the horn but at the same time it's got this milk chocolate sound." Mike Corrigan grew up in Maryland. 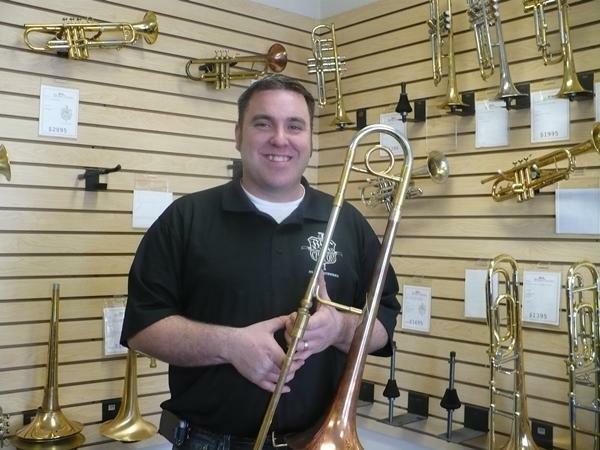 His high school band director found he had a knack for fixing horns, and suggested he attend an instrument repair school in Minnesota. From there, Corrigan apprenticed at S.E. Shires, a Boston manufacturer of custom brass instruments. 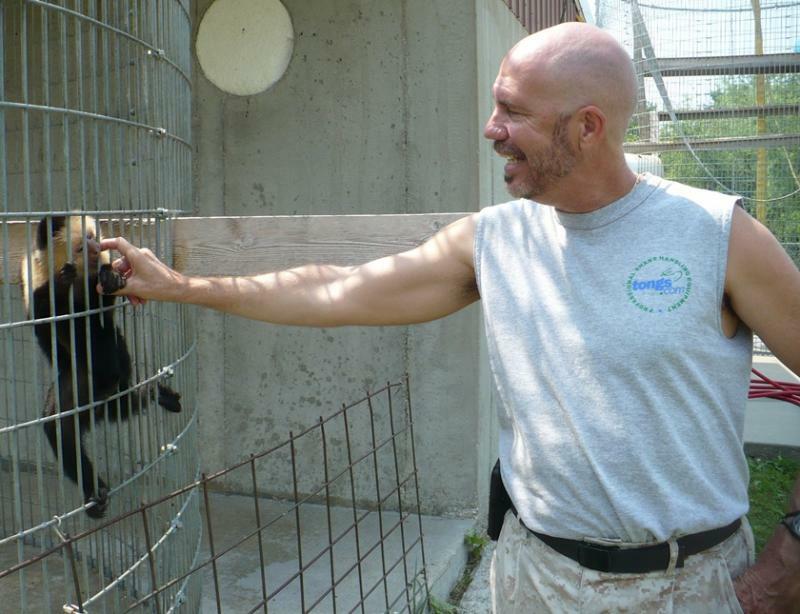 He moved to Overland Park in 2004, because his wife grew up in the area. Corrigan’s 31 now, and has 11 employees at BAC Horn Doctor. 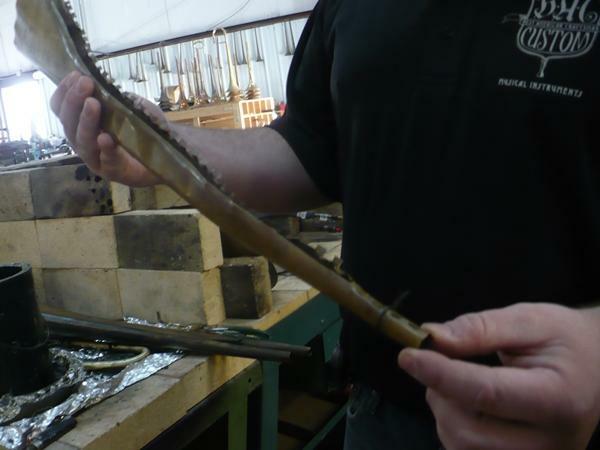 They repair woodwinds now and started working with area schools, and many local musicians. But Corrigan's reputation is probably growing faster in New Orleans. Where On Earth Am I Right Now? He made his first trip there the year after Hurricane Katrina. "I know a lot of people were going down to New Orleans to help rebuild houses and help with the cleanup and all that," Corrigan says. 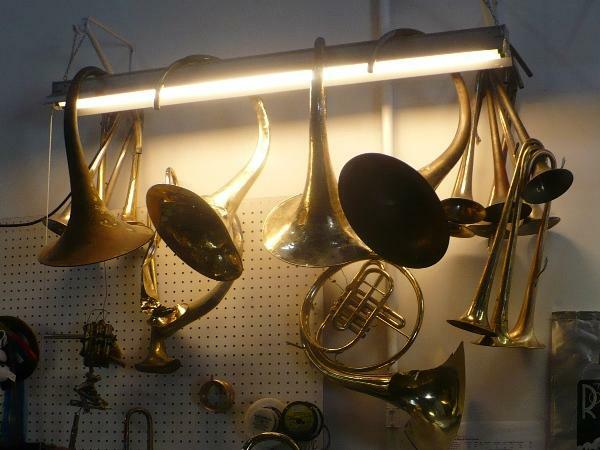 "But what I decided to do was bring the repair shop down, set up, and just repair horns for the musicians down there." Corrigan and an employee set up a converted concession stand in the parking lot of a church in Tremé. (That's the traditional musicians’ neighborhood, the one the HBO series is about.) Pretty soon they had a long line, including a lot of teenagers. "When we finished that last horn that first night, the kids all said, 'Well, we want to show you that we thank you for fixing our horns, we want to play you a song.'" Corrigan was nervous about that. It was late, and a school night. But the 20 some teens just started wailing on their horns. Pretty soon, Corrigan says people were coming out of their houses, but instead of yelling, they started clapping their hands and dancing. "And I'm thinking, where on earth am I right now? This is crazy!" Corrigan has ended up going down to New Orleans once or twice a year to repair instruments. He’s gotten to know a lot of people, and recently received a proclamation from the mayor, thanking him for his service to the musicians of New Orleans. He's become particularly close to the rising star Trombone Shorty, who also plays with the Rebirth Brass Band. They just won a Grammy for their album, The Rebirth of New Orleans. On the album, all but one of the musicians are blowing Mike Corrigan’s horns. Corrigan says there’s nothing like hearing the results of his labor on a recording or on stage. The first time he felt it was when he saw one of his trombones in a Broadway show. "When I saw that that was a piece of me on that stage, and that was really, really cool." Mike Corrigan hopes to move his Olathe shop to downtown Kansas City someday to be closer to the music scene, and to the musicians. That is, if New Orleans doesn’t steal him away. Belton, Mo. – Rod Richter has been interested in bees since his childhood. A firefighter by trade, Richter is a part time beekeeper, with emphasis on the word keeper. He is not a bee exterminator but a bee re-locator. The long days of summer are here, and at least some kids are splashing in creeks, looking for frogs and snakes. But how many will turn that curiosity about animals into a career? For KC Currents' Odd Jobs segment, Sylvia Maria Gross recently visited Greenwood, Missouri, where a local daredevil took his childhood love of creepy, crawly things and turned it into a business. Where To Next For KC Jazz? The past few months have been rough for local jazz. Two promising newer venues, 1911 Main and Café Augusta in Lenexa, have shut down. 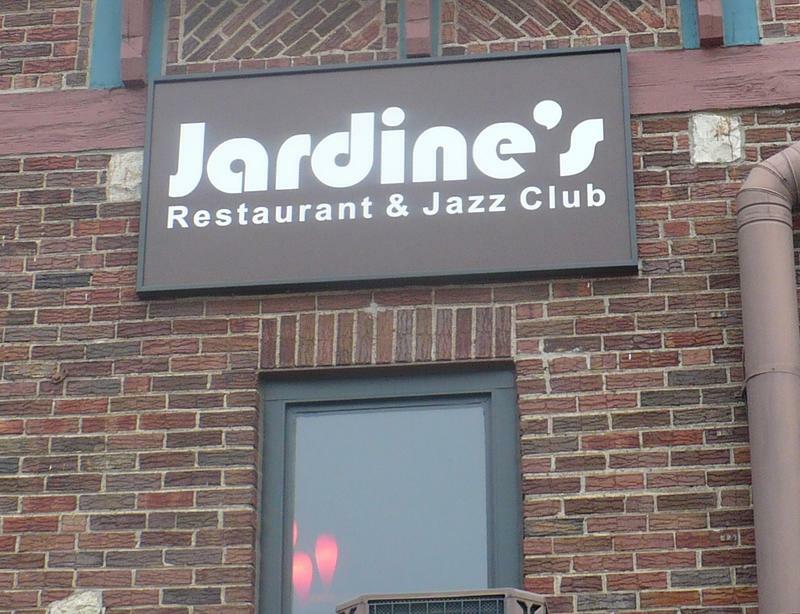 And at Jardine's Restaurant and Jazz Club, one of the city’s most celebrated venues, a dispute between the owner and employees led to a boycott by musicians. The restaurant then closed its doors, and its future remains up in the air.